You are here: Home>Herts history>People>Christina of Markyate, Religious Visionary. Christina of Markyate, 1095-1155, a religious visionary who freed herself from an arranged and violent marriage and began a community for women like herself. Christina of Markyate was born with the name Theodora in Huntingdon, England about 1096–98 and died about 1155. She was an anchoress and prioress who came from a wealthy Anglo-Saxon family trying to accommodate with the Normans at that time. She became head of a community of nuns. Originally named Theodora, she was born into a wealthy merchant family. Her mother’s name was Beatrix, marking an effort to appear more Norman, and her father’s was Auti. Her mother told a story of “knowing” her daughter would be holy because a dove had flown into her sleeve and lived there for seven days while she was pregnant. As a child, Theodora is said to have talked to Christ “as if he were a man whom she could see.” She befriended an older man named Sueno, who became her first religious mentor. It is mentioned in her hagiography that Sueno had once led an unholy life and that Christina’s faith renewed his, so that they helped each other. Theodora visited St Alban’s Abbey in Hertfordshire with her parents as a teenager, and the visit apparently instilled in her a deep faith that prompted her to make a private vow of chastity. Of this she told Sueno, but no one else. 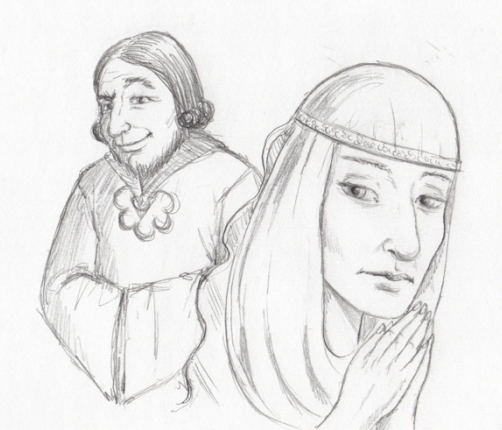 While visiting an aunt, Elfgifu, Theodora met Bishop Ranulf Flambard. Her aunt was the bishop’s concubine and he sought to inflict this on Theodora as well. According to one account, when Ranulf attempted to force his attentions on her, she suggested that she lock the door. When he agreed, she proceeded to do so, from the outside. 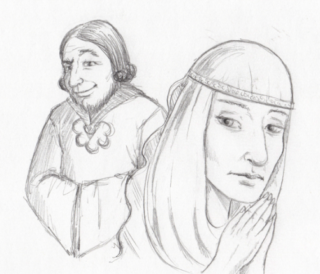 Rebuffed, he then exacted revenge by brokering a marriage for her with a young nobleman named Beorhtred. Theodora’s parents readily agreed, but Theodora did not, in view of her vow. Her angry parents arranged for Beorhtred to have access to her room, only to discover next morning that the two had spent the night discussing religious subjects. On one occasion Theodora recounted the life of St Cecilia, who according to legend, was guarded on her wedding night by a vengeful angel. On another occasion, she hid behind a tapestry while Beorhtred searched for her in vain. As word went round of Theodora’s plight, a hermit name Eadwine, with the blessing of the Archbishop of Canterbury, helped her escape, disguised in men’s clothes. Eadwine then took her to stay with an anchoress at Flamstead named Alfwen, who hid her from her family. Here Theodora changed her name to Christina. Christina next found shelter with Roger, a hermit and sub-deacon of St Alban’s Abbey, whose cell was at Markyate. She spent her time in prayer, sewing to support herself. She was a skilled needlewoman, who later embroidered three mitres of superb workmanship for Pope Adrian IV. After two years, Beorhtard released Christina from the marriage contract, and Archbishop Thurstan of York formally annulled the marriage in 1122. Thereafter Christina was able to come out of hiding and move into a small hut. Upon the death of Roger, Christina took over the hermitage near St Alban’s Abbey, where she reportedly experienced frequent visions of Jesus, Mary, and St Margaret. Other women, including her sister Margaret, joined her there. Christina took her vows at St Albans in 1131. Markyate Priory was established in 1145. Geoffrey de Gorham became abbot of St Albans in 1119, and as prioress, Christina became his close friend and counsellor. Their friendship was such that he is said to have altered the St. Albans Psalter as a gift for her, by having an illuminated “C” placed at the beginning of Psalm 105. Her Vita was apparently written by a monk of St Alban’s Abbey. Christina’s hagiography is considered to be one of the most realistic that we know of. Some parts still follow the typical route of hagiographies, a vow of chastity, overcoming all obstacles including marriage, and even being an anchoress. However, other parts pull away from the norm. Christina is shown as having power as prioress of St. Albans. She is also one of very few to be shown having sexual desire even though she overcomes it. Her hagiography is incomplete. Parts were lost in a fire in the 18th century and it is unknown whether the biographer wrote the account before or after her death. In the light of the priory’s legal foundation by St Paul’s, the friendship between Christina and Geoffrey seems likely to go back to a fiction by Matthew Paris (c. 1200 – 1259), who alleged in his chronicle that St Alban’s Abbey had clerical competence over the nuns of Markyate. “It would almost seem that in the Gesta Abbatum the origins of Markyate and Sopwell have been confused. There Markyate Priory is said to have arisen through the occupation of the hermitage of Roger, a former monk of St. Albans, by a saintly recluse called Christina, for whom abbot Geoffrey built a house. But in reality Markyate was not dependent on St. Albans, as it would have been if founded by the abbot, and as Sopwell was.” “It is therefore altogether very possible that what we are dealing with here is a later piece of fiction from a monastic chronicler.”A medieval cult of the anchoress Christina is not substantiated by liturgical or historical sources. The existence of the Vita and references to Christina in the Gesta Abbatum Monasterii Sancti Albani still suggest some interest in instigating such a cult in the 13th and 14th centuries.